The banner at the top of this page is not mine. Credit to The Axis Church of Nashville. I almost went to church today. If I visited one church per week in Nashville, it would take me over 13 years to visit them all. Well, I’m three and a half months in, folks, and I’m already tired. I understand my twenty-something peers a little better now. I understand why you’ve stopped trying to go to church. I’ve never liked shopping, and this is what all this visiting feels like to me. I examine the colors of worship to see if they match with my idea of what is authentic and humble and excellent. Let’s try on some hats. Does the pastor’s message fit my head just right? And what about those prices… are people truly authentic here or are they trying to sell me something? And gosh, I’m into the environmentally-friendly, fair trade, stuff, you know? Like is the church spending money on a gluttony of stuff for the insiders or is it really making a difference and forsaking comfort to truly love the insiders and the outsiders? The mission and vision–like a pair of shoes. Do they squeeze my toes so much that I’m uncomfortable or do they leave so much room that I’ll just walk right out of them and not even notice? I’ve never had this many church options in my life. I went to the same church for 17 years–my parents helped start it. When your parents are that involved, there’s really no other option. And most of the time, I liked it that way. When I went off to college, there were about ten feasible options within driving distance. Easy. I’d like to blame the gluttony of churches, but that’s really not the problem here. The fact is, probably at least 500 of the 700 churches here in Nashville are Christ-centered communities of broken believers loving and learning from God, from Jesus, together. That’s all I want. I was so close to going to church today. I tied the last knot in my shoe, then sat back and my mind wandered. It wandered to places where I’ve found my community. And I realized that my “church” has never been an actual church, or even the people in a church. My church has always been with whom I have lived and shared my life. This mutual edification, the vulnerability, the together-worship, the pointing each other back towards God, the celebrating . . . has all occurred within the shelter of living together. I realize that my college community experience may be a strange one, but when I lived in such close proximity with 30 girls who were sincerely trying to follow Jesus, it was more difficult not to have real community than it was to share our hearts with one another. And honestly, I think that’s how it should be. And it all started with being thrown together in one living space. The institution of the modern-day church is a broken one. And it’s a sad but necessary truth that “in the real world” we have to push through the practice of Sunday morning to get to the every day living in Christ. And for new movers to an area, it’s incredibly draining and difficult. When the church was just getting started, believers lived together, or at least in close proximity (Acts 2). They gave away all their excess of money and things to love one another well (v45). They worshipped together every day, shared precious meals and time with one another (v46). They enjoyed each others’ company and God was so evidently at work in this community of believers (v47). Community groups, small groups, life groups, whatever you want to call them . . . I think this is where we (meaning the Body of Christ, the Church as a whole) should start. We’ve got the order flip-flopped. In all our haste to try to make people feel safe and noticed-but-not-too-noticed and accepted-but-not-too-accepted, we’ve thrust newcomers into a large crowd of tightly-knit people on Sunday morning. We’re hoping this rather isolating experience will somehow make them feel loved. We’ve automatically made outsiders of the people we are trying to reach. All this, and what now? I’m not particularly angry at the 700 churches in Nashville. I am angry about how difficult it is to enter into life-together-community. I knew it would be, stepping out of my close-knit wing at college. Churches have tried so hard to break down barriers. I appreciate the effort. But there is still so much barrier breaking to accomplish. Can we ever manufacture what actual living together can help create? Why do churches that start out in a house ever leave? Why not expand into other nearby homes instead of creating yet another building that shouts singularity and institution? Why not make the act of daily living together a priority instead of trying to expand, expand, explode? I’ve probably raised more questions than answers, and this blog post is very long. You’re welcome. Still, I will think less of church shopping and more of church hoping. And I will maneuver through the awkwardness and the too-many options and the buildings we have created that are shadows of actual living together because I know that at your core, Church, your heart is in the right place. And when I get to your core, I will find that community I long for, a community I miss more and more with each passing day. It’ s the taste I have had of real Christ-centered community that keeps me on the move. If you have never tasted that kind of community, I have more compassion for you than ever. Please don’t give up on the Church and even on little “c” churches, fellow twenty-somethings, thirty-somethings, forty-and-beyond somethings. I know it’s hard. People mess up and hurt you. People try to understand, but don’t. But we’re all just trying to ride the waves of a messed-up world with Jesus as our Navigator. Hang in there, make every effort to enter into a community of Jesus-followers, and you’ll finally see God’s glory shining through the cracks of manmade brokenness. And it will be worth the wait. What does your Christ-following community look like? Are you a part of such a community? Why/why not? Have you given up going to a church? What could be the benefits of not giving up on the Church’s broken efforts of loving you? I’m not satisfied with who I am. It’s a fact of life with which I’m trying to come to terms. There are many characteristics I want to have that I just don’t, many default reactions to life that I would love to have but are far from natural for me. Can you relate? I wish I was selfless, for instance. Like, Katniss selfless. I volunteer as tribute! Or loyal. Samwise Gamgee I-can’t-carry-it-for-you-but-I-can-carry-you loyal. Lindsey is a hypochondriac and generally fear-ridden human being that, when confronted with adverse circumstances, becomes a functionally useless puddle of tears. Haha! I have to laugh at myself, or else it’s too painful a thought. We all have fundamental human deficiencies that we wish were not a part of us. We’re all most attracted to characters in books and movies that fill some sort of void in our deficiencies. If I were Katniss-Samwise-Harry-Lindsey, boy, would I be able to face anything! I’d also look a little weird. I’m just Lindsey, though. How do I deal with that? 1. YES! I love that movie. Classic. 2. Aww…such a sad movie! 3. I hate that movie. There are literally no apathetic reactions to this movie. I watch it every year with my family, and I never tire of it. I won’t spoil anything for those of you who haven’t seen it. 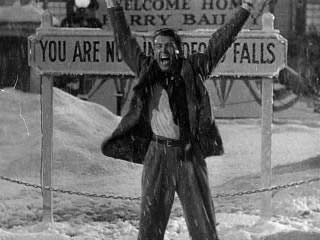 George Bailey is a mess of a man. He’s a reluctant hero with high pride and high dreams and a growing bitterness at his lot in life. Suffice it to say, even fault-filled George’s life is full of wonderful influence that has touched, encouraged, and improved so many lives in his “crummy little town”. Yet, somehow, George is blind to his good influence. He only sees his mess-ups, his missed opportunities. Sound familiar? I know I can relate. You know what’s beautiful about God, about our relationship with Him? He doesn’t pay any attention to those faults that we spin around our heads and hearts until we’re dizzy-sick. He sees the righteousness of Christ and when we limp over to Him in broken-down pride with all our weakness, He lets us lean into His strength. God knows all our thoughts and feelings intimately, and, best of all, He shows how Jesus fills our voids, our discrepancies, our weaknesses. And sometimes, and this is a favorite mystery, He invites us into paradox. Exhibit A…when something bad happens in one of my close circles, I am truly one of the people furthest away from feeling hopeful. And yet, hope is one of those things that most enthralls me. I write songs about it, I try to encourage people with a truth I struggle feeling! I marvel and cry over the sweet hope God gives…it’s an unspeakable mercy. I wrote this song over the past few weeks. My inspiration comes significantly through stories of hope like these. And an insatiable desire to let what-I-am-not be carried by Jesus, our Living Hope. What are your “wannabe’s”? How can/do you find your particular “wannabe’s” satisfied in Christ?